Concrete By Sennstrom is a concrete company based in Batavia, IL serving the surrounding suburbs. 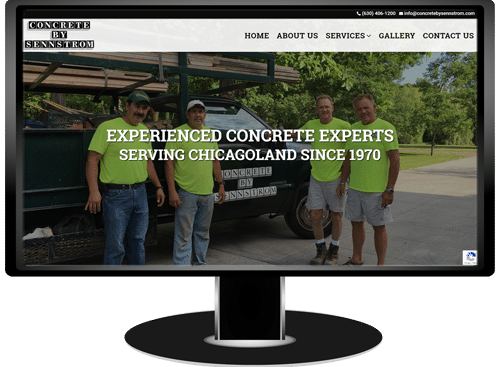 Tom Sennstrom, the owner of Concrete By Sennstrom was looking for a professionally designed, responsive website with great SEO to replace his previous website that was dated. This website was built on the WordPress platform and features a full page responsive image slider, responsive grid design, informational pages for their services, a great image gallery, a contact form with custom fields, an SSL certificate, Google Analytics to track visitors, sitemap submission to Google and Bing and social media page creation and optimization. This website features great Search Engine Optimization (SEO) that should help Concrete By Sennstrom grow for years to come. Indiana Roofing Company is a roofing company based in Hammond, IN serving Northwest Indiana. 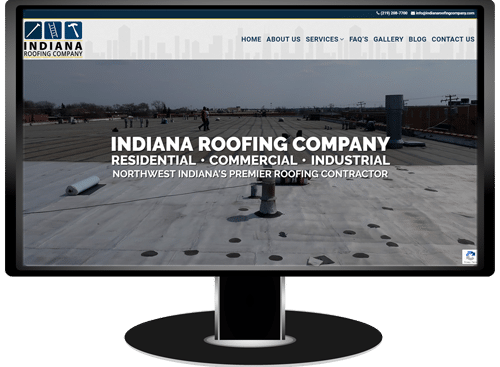 The owner of Indiana Roofing Company was looking for a professionally designed, responsive website with great SEO. His previous web developer underperformed to say the least. This website was built on the WordPress platform and features a full page responsive image slider, responsive grid design, informational pages for their services, a great image gallery, a contact form with custom fields, an SSL certificate, Google Analytics to track visitors, sitemap submission to Google and Bing and social media page creation and optimization. This website features great Search Engine Optimization (SEO) that should help Indiana Roofing Company grow for years to come. Expert Super Seal Roofing & Tuckpointing is a company based in Chicago, serving the entire Chicagoland area. The owner of Expert Super Seal Roofing & Tuckpointing was looking for a professionally designed, responsive website with great SEO to help grow his company. This website was built on the WordPress platform and features a full page responsive image slider with a parallax effect, responsive grid design, informational pages for their services, a great image gallery, a contact form with custom fields, an SSL certificate, Google Analytics to track visitors, sitemap submission to Google and Bing, a blog which integrates with social media and social media page optimization. 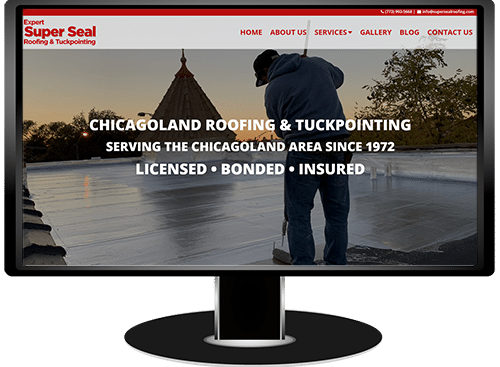 This website features great Search Engine Optimization (SEO) that should help Expert Super Seal Roofing & Tuckpointing grow for years to come. Northern Holiday Lighting is a residential and commercial Holiday Lighting company based in Glenview. 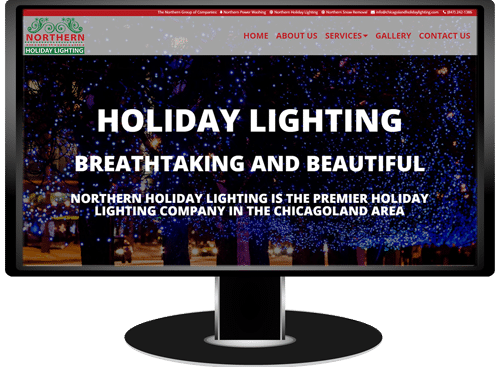 The owner of Northern Holiday Lighting was looking for a professionally designed, responsive website to promote his company. This website was built on the WordPress platform and features a full page responsive image slider with a parallax effect, responsive grid design, informational pages for their services, an awesome image gallery with sorting options, a contact form with custom fields, an SSL certificate, Google Analytics to track visitors and sitemap submission to Google and Bing. This website features great Search Engine Optimization (SEO) that should help Northern Holiday Lighting grow for years to come. 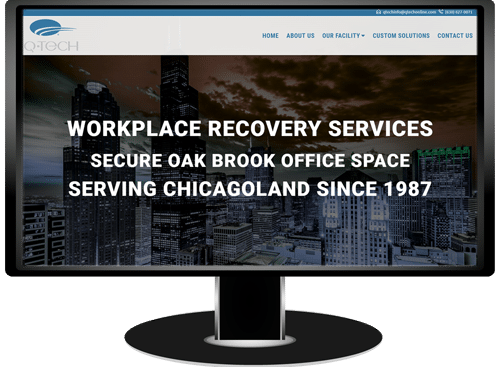 Q-Tech Communications has workplace recovery office space in Oak Brook. The owner of Q-Tech Communications was looking for a professionally designed, responsive website to promote his company and their facility. 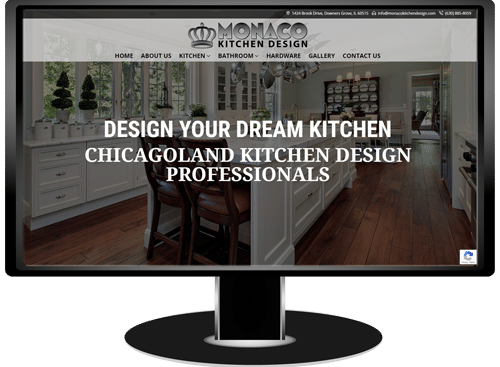 This website was built on the WordPress platform and features a full page responsive image slider with a parallax effect, responsive grid design, informational pages for their services, a contact form with custom fields, an SSL certificate, Google Analytics to track visitors and sitemap submission to Google and Bing. This website features great Search Engine Optimization (SEO) that should help Q-Tech Communications grow for years to come. Viking Flooring Solutions is a specialty tile and flooring store located in Downers Grove. 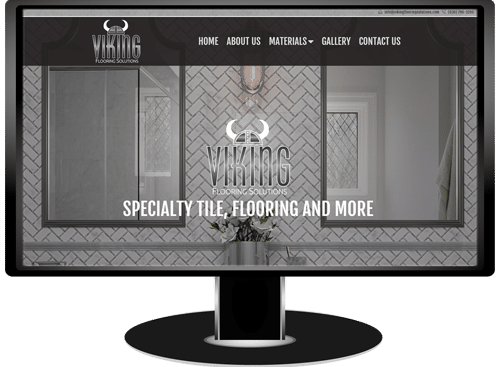 The owner of Viking Flooring Solutions was looking for a professionally designed, responsive website to promote his company and the products they offer. This website was built on the WordPress platform and features a full page responsive image slider with a zoom effect, responsive grid design, individual pages for the various materials they sell, a responsive image gallery with sorting, a contact form with custom fields, an SSL certificate, Google Analytics to track visitors and sitemap submission to Google and Bing. This website features great Search Engine Optimization (SEO) that should help Viking Flooring Solutions grow for years to come. Crown Roofing & Masonry is a company that focuses on Roofing and Masonry services in the Chicagoland area. 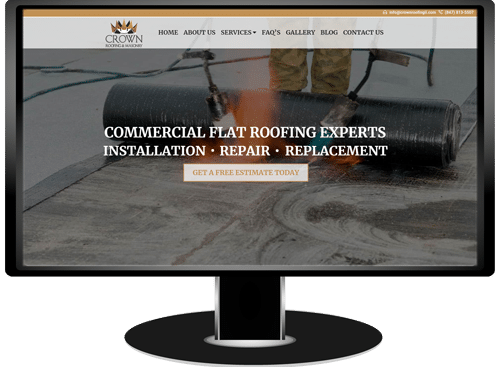 The owner of Crown Roofing & Masonry was looking for a new professionally designed, responsive website. This website was built on the WordPress platform and features a full page responsive image slider with a zoom effect, responsive grid design, service pages, a responsive image gallery with sorting, contact form with custom fields, a free SSL certificate and Google Analytics to track visitors. Optimizing their website for search engines was key and should help their business grow for years to come. Delta City Construction & Painting is a company that focuses on Commercial Construction and Painting in the Chicagoland area. 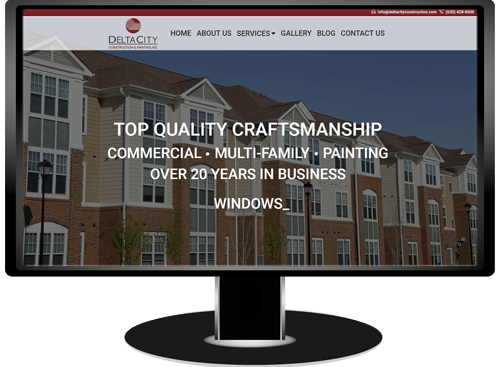 The owner of Delta City Construction & Painting was looking for a new professionally designed, responsive website. This website was built on the WordPress platform and features a full page responsive image slider with a zoom effect, responsive grid design, service pages, a responsive image gallery with sorting, contact form with custom fields, a free SSL certificate and Google Analytics to track visitors. Optimizing their website for search engines was key and should help their business grow for years to come. 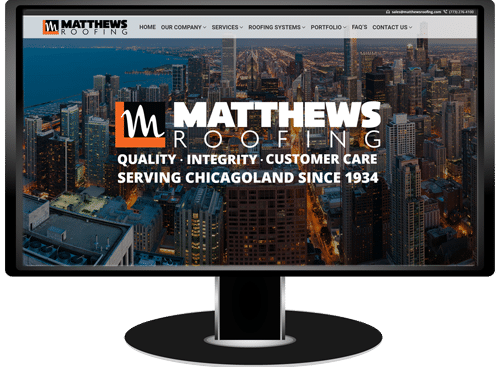 Matthews Roofing is one of the largest Roofing companies in Chicago. The owner of Matthews Roofing was looking for a new professionally designed, responsive website. This website was built on the WordPress platform and features a full page responsive image slider with a zoom effect, responsive grid design, many service pages, a responsive image gallery with sorting, contact form with custom fields, a free SSL certificate and Google Analytics to track visitors. Optimizing their website for search engines was key and should help their business grow for years to come.